Color temperature is measured in Kelvin and at 4,000K it falls in the range of "cool white" and "bright white" which is determined as the ideal color for reading and studying. Lux is a unit of light that measures light intensity. It measures how much light can be perceived by our eyes without causing over-sensitivity, or irritation. The new lighting installations ensure that the same level of intensity can be obtained and remain constant and consistent, in most cases. A color rendering index (CRI) measures how accurately a light source illuminates the true color of objects. Our LED lights have high CRI values (>80), indicating that they are able to produce white light similar to natural daylight. Ripple effect is the so called “flickering of lights”, a phenomenon that is common to all fluorescent lights and occurs in most of the LED lights in the market, a fact that is not widely known to most people. According to medical studies carried out by various institutes worldwide, this phenomenon may lead to eye irritation, annoyances, headaches, or even hazards in eye health after long periods of exposure. It may mostly affect sensitive persons. Our LED decision seriously took this parameter into consideration and meets the highest standards for minimum ripple effect to ensure high health and safety standards for the students, visitors and employees of ACS Athens. The new LEDs consume significantly less energy than the old fluorescent lights; the estimate is about 50% less, offering a remarkable reduction in energy operating costs. All types of light emit radiation in the light spectrum. Most hazardous is the electromagnetic radiation of wavelengths ranging from 100 nm to 1 mm. Commonly discussed hazards affecting the eye are blue light hazard (BLH) and age?related macular degeneration (AMD) which can be induced or aggravated by high intensity blue light. For this purpose, a standard methodology has been developed which categorizes the lights in risk groups from 0 to 4 (0 is the best and 4 is the worst). Lights that are tested and fall in the 0 or risk group 1 are considered the safest for the human eye. New LED lights installed at ACS Athens identify with risk group 0 which means they offer the maximum optical safety, especially against blue light. Lifetime and lifecycle of a product is another important parameter. However, theoretical lifetime usually varies from real lifetime. For this purpose, international standards have been developed to determine the real life time of a LED light, the so called LLMF. Special tests have been developed to simulate the real behavior of the LED in time and to determine the real maintenance life in terms of luminosity. Our LED lights have passed the related tests set by international bodies with remarkable results. We estimate that they will be effectively working for more than 15 years under normal working conditions. In addition to testing, our new LED lights offer some "preset dimming options" providing the advantage of adjusting the level of light to extend their lifetime. 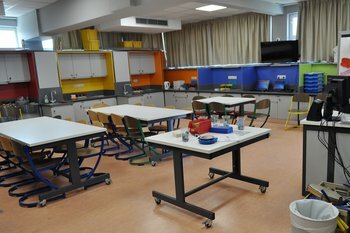 A classroom in the Elementary School was fully renovated and was turned into a contemporary and stylish laboratory providing a colorful and well-equipped environment for the students. The new lab provides: individual and group work stations, many network spots, an LCD screen that offers easy access to students’ wireless devices, a starboard, fully equipped independent central benches, plenty of cabinets, sink units to conduct experiments and air-conditioning. "It allows children to have a hands-on experience which ensures that everyone is part of the learning process. The Elementary School Science Lab builds the foundation for children entering Middle School. Allows for in-depth study; A place for them to explore; Children are engaged in science". 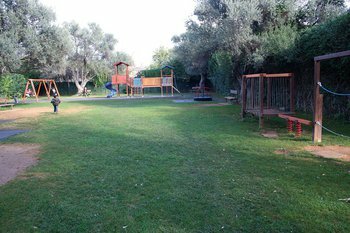 he Kindergarten playground has been inspected, maintained and certified by TUV (an international standards and certification body) during this summer, conforming to the high safety standards of this well known organization. As part of an ongoing maintenance and renovation plan, we replaced a few of the main electric panels. It is part of our strategy to invest not only in what is visible but also in the infrastructure of the campus, which is critical to the safe and uninterrupted operation of the school. Various building facades have been properly treated in order to ensure safety and improve aesthetics. Plastering and deep treatment were completed in certain areas of the annex, the administration building and the main library. 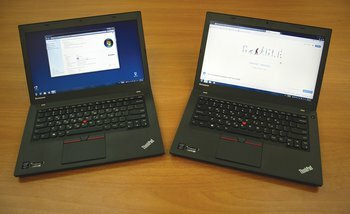 We received 14 Thinkpad T450 Ultrabook laptops intended for special projects on campus. They are powerful enough to perform video editing and multimedia design tasks. Each laptop is equipped with 8GB memory, SSD drive and a battery that can last up to 12 hours. These laptops were donated to ACS Athens by the Think Global School which was hosted on our campus last year. Moreover, the PTO donated 28 Thinkpad x201 laptops and 2 laptop carts. The computers have been distributed in the 2 carts and are assigned to the Elementary School students. 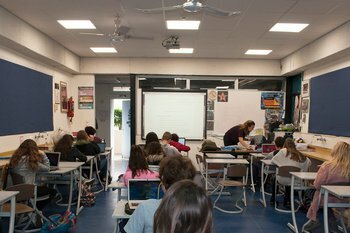 Laptops are equipped with SSD drives, 4GB memory and may provide fast and efficient computer experience to the students.The carts also function as a charging station for the laptops allowing students to use these computers without a power adaptor for up to 5 hours, providing Elementary School students with the same resources as Middle and High School students. We would like to thank the PTO for its generous and consistent contributions to the improvement and upgrading of our school every year. In addition to the projects listed above, many other works have also been carried out by the maintenance crew throughout the year. We would like to extend a heartfelt “thank you” to the team for their hard work and dedication in completing all tasks on time and for keeping ACS Athens infrastructure in pristine condition.